It is two years and two pants sizes since I went to Everest. I am none to happy about how I am leaving the USA but it is what it is. Today, Maggie and I headed off to our final preparatory hike before our departure. It was a great morning. Cool yet comfortable. I have been battling some ankle swelling and have been a bit concerned about that. But today was all about that last effort on home soil. bed and noticed Jack the older of my dogs was not his usual cheerful self. He kept looking out in the loft as if he were watching a ghost. I walk out there and there it is. 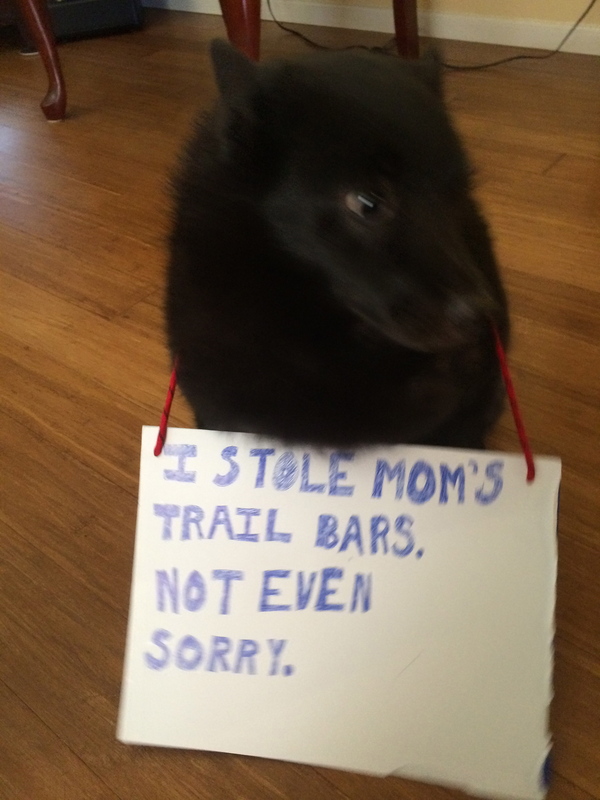 The oat bar he had drug up after having gotten in my trekking duffel bag and taken out my trail bars! So that was the answer to all the trouble!!! I went downstairs to find them strewn about, unopened. Mystery solved, but that didn’t change the fact I was BEAT before we even began. Maggie got to the house and we loaded up ol’ Ace the Honda Pilot and set out for the trail-head. We yacked about the trip, how much packing we had to do, what tips we would have on hand for the porters and crew of Mountain Madness, are spa day at the end of the trip and other sundry topics as they randomly came to mind. Then we arrived at the trail-head and laced up our boots. 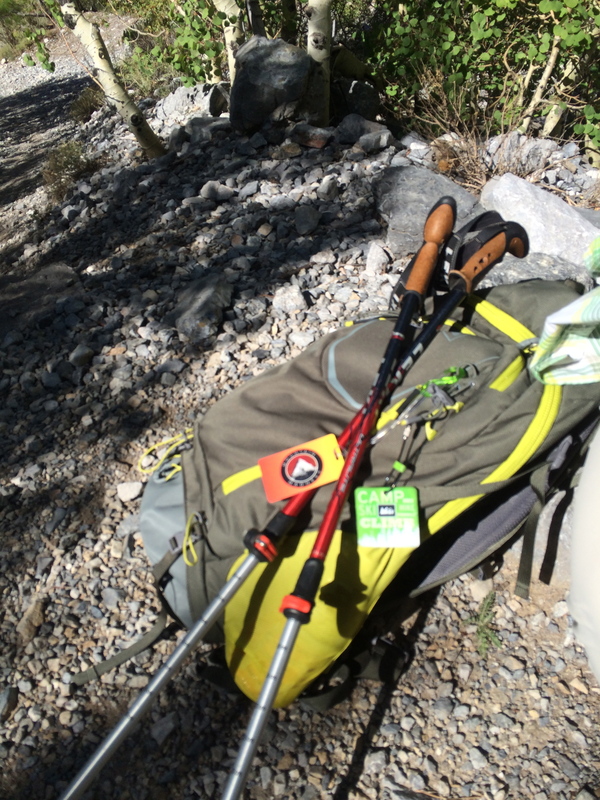 We donned our packs and grabbed our poles and off we went. 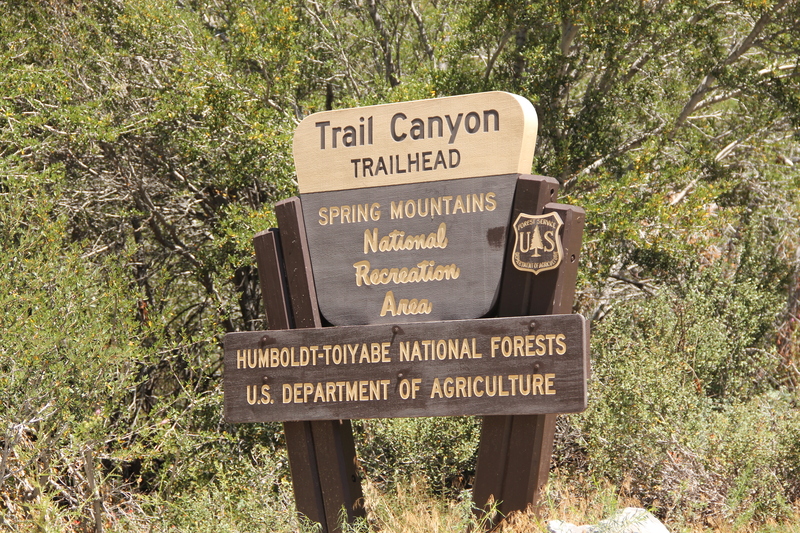 Today’s hike was Trail Canyon. It is a two mile hike up hill, rated very strenuous. 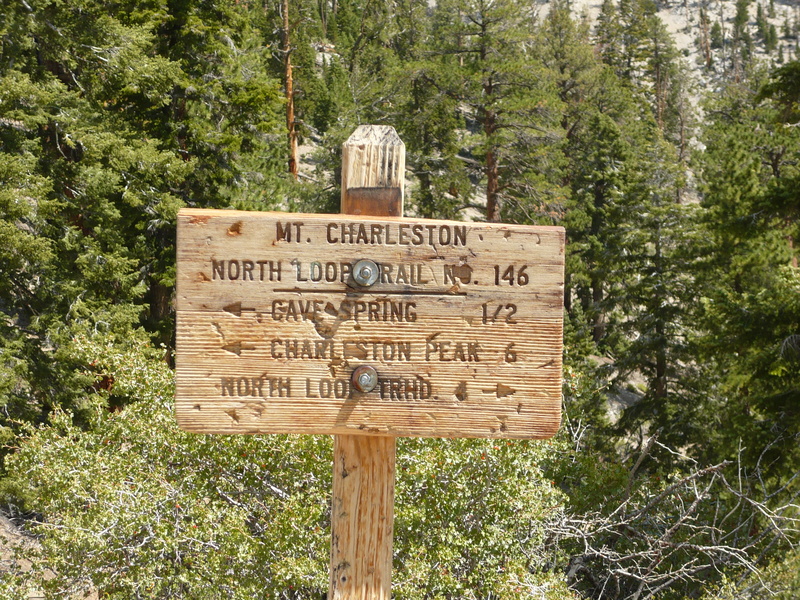 You gain about 1500 feet over the course of the trail. Though Maggie and I both felt Rain Tree was more difficult. But ut was quiet….for the most part…..and nice and really a good way to finish our preparations for Machu Picchu. I told Maggie to hike her hike and pretty soon she was far enough ahead of me that I didn’t see her any nore. 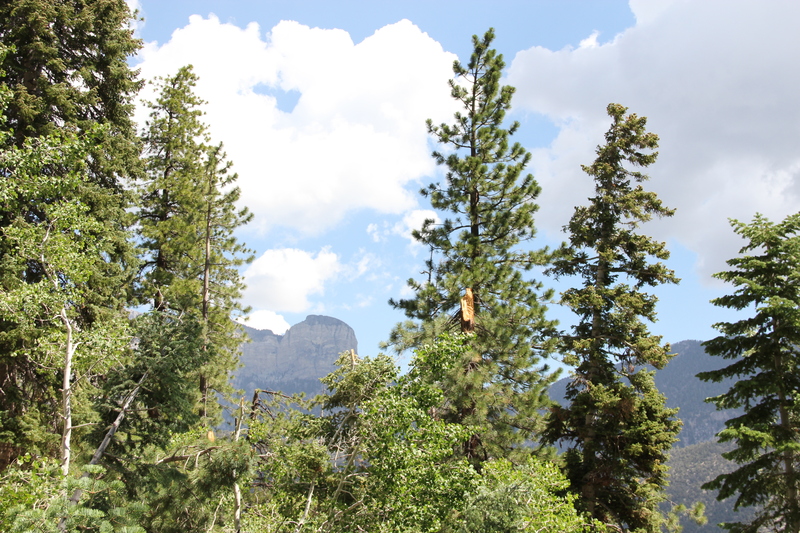 I made my way up trail in my own slow style, stopping to enjoy the surroundings and breathe in the fresh air of summer. 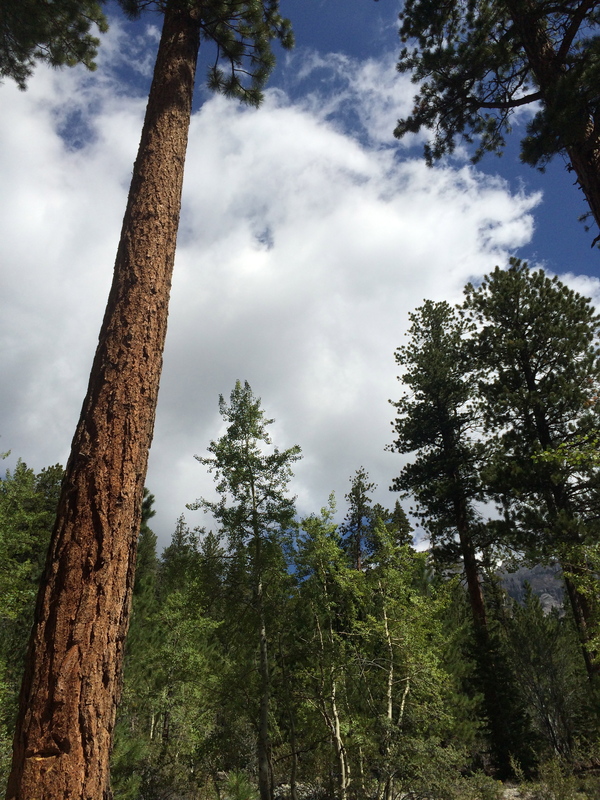 The Aspen and Pine forest was filled with the sounds of birds and bugs and that was refreshing. Unfortunately there were a few groups of loud people that came through. One in particular was a gaggle of high school aged girls. Back of the pack of hyena girls. Maybe a dozen of them. None but a few even had water with them. But all the way up and down the trail they screamed as if they were being murdered just to hear the echo. Nobody leading them told them what bad trail etiquette it was to do that. The pushed passed and never said excuse me or thank you. Just hollering and yelping foolishly. But they were not going to ruin a beautiful day of hiking for Maggie and Me. We took in the day, thought about what was ahead of us and were both pretty happy with the day’s work. 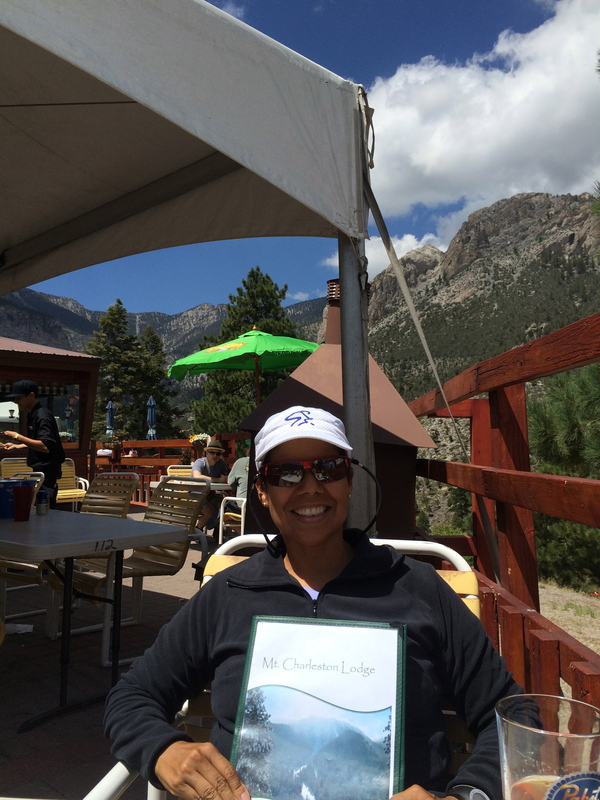 After the hike, we drove up to the Charleston Lodge where Maggie treated me to lunch and conversation. I have found a real friend in Maggie. She is a great adventure partner and we can both enjoy our hikes without expecting the other to “hike my way”. A fine meal with a fine friend! So that is it. Over a year of training in various ways and times to get ready for this big trek. My second, Maggie’s first. The journey has been great. Ups downs ins outs. All part of the big thing called life and we are finding in our 50’s there is much of it to be lived. 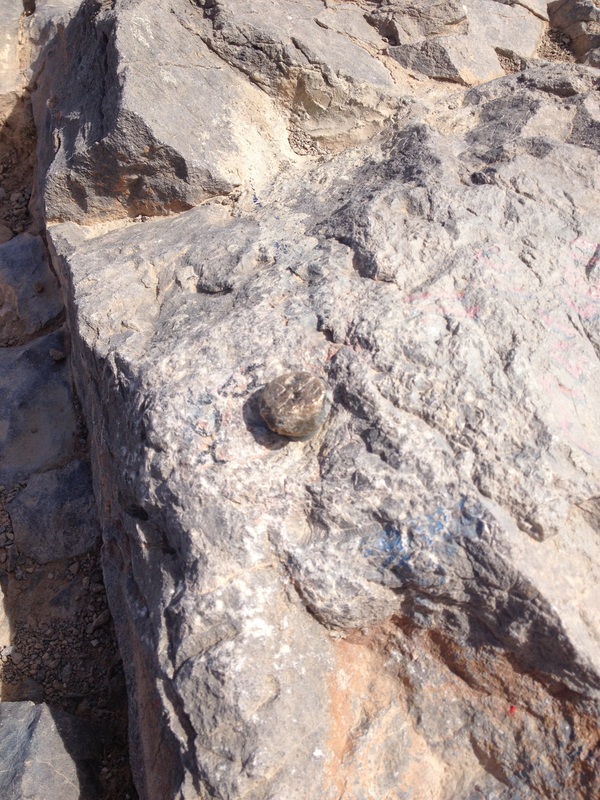 There is a little bump of rock that sits in the Las Vegas Valley east of the Red Rock Conservation Area and literally an arm’s length from the 215 AKA Beltway freeway. It can bee seen from all over the valley, sort of by itself. Thus the name, I would conclude. I never had a reason to want to hike around there. But a friend mine who lives on that e4nd of the valley has always wanted to do it just to ay he did. So Saturday we set out. It was early and windless and quite a nice morning to be out. The thermometer was predicted to be in the triple digits but I was not worried. My research had told me that this was a half mile hike that would end up with a 600 foot elevation gain. I figured a short burst of work, a peek around the valley and back down. We headed up and it was a bit steep as I thought it would be. As often happens, at least for me, the ultimate top of a hike is not visible from the bottom of it. From this perspective I thought there would be this first stretch and another short one. Because it was 1/2 mile……right? WRONG!!!! As it turned out we had not taken the short route as described (a bit incorrectly) by the source I looked up. Instead we were on track for steep and long. About three miles. We took a nice view of the valley northeast of the rock while we were at the saddle. From here there were additional steep sections to attack. My friend is not a real avid hiker. He was happy I gave him my trekking pole since he wore court shoes. The steepness was work going up, but coming down proved to be more work. Lots more. My quads went from hot fire burning globs to jelly like puddles that were useless for anything from being fired the entire return trip. But I get ahead of myself. 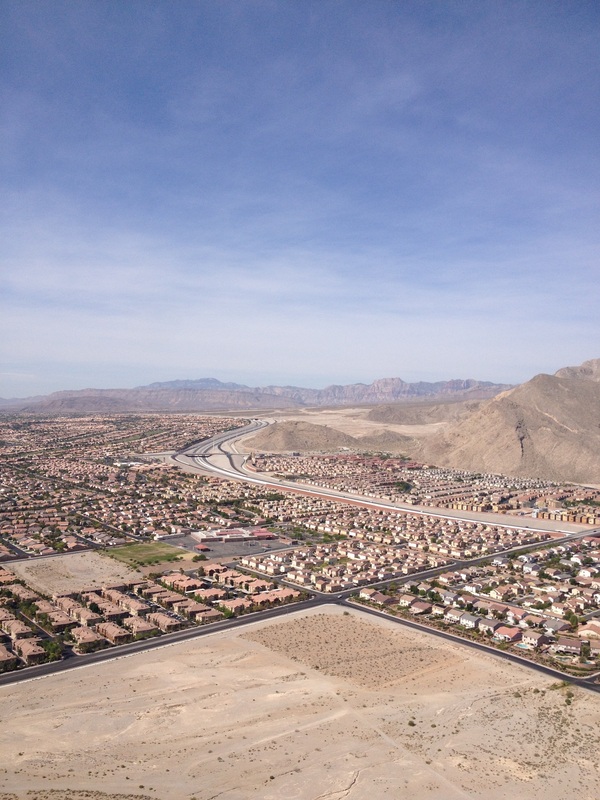 We hit the benchmark and at the top got a hazy morning view of the entire Vegas Valley. We had run into another hiker who uses this as a training hill. That seemed to be the norm there…lots of people powering up and down to get fit. We spoke with the one guy who said in the summer there are lots of gnats at the top of the hill. But it was not gnats, it was FLYING ANTS! They were everywhere and as a result the stay at the top was not really very fun. Appears that one guy didn’t get out of there before the gnats got the best of him! 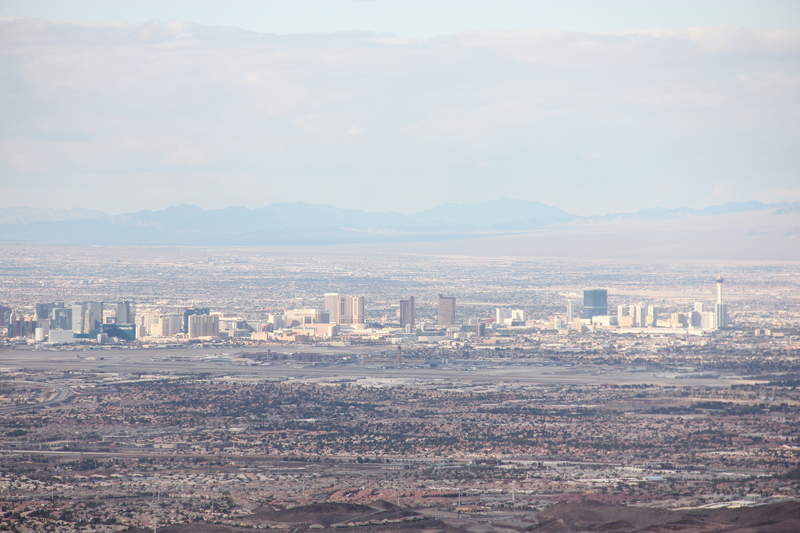 You can see the hazy day over Vegas in the distance. It did clear some as time went on. But it also got hotter fast! This little suburban hike was a great test of hiking in less than aesthetic surroundings and sticking with it in the heat, gnat attacks and even during what was a bit of heat over exposure to complete the task. 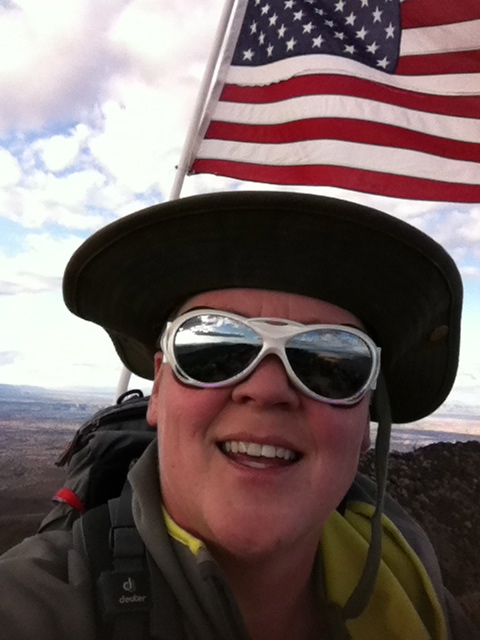 I realized that two years ago my Everest experience had built my endurance mentally. This was certainly more for getting to the top than enjoying the trip. Though it was fun to make sure my boots were performing, which they did in stellar fashion! This was not near as steep as day two in Machu Picchu will be, but it was a nice test run for fitness gains. My kettle bell challenge is actually showing good fast results in the strength department, that was clear! After we returned to the care in triple digit temps, my friend had felt a sense of accomplishment for doing what he had wanted to do for many years. But he doesn’t hike…….at least he didn’t used to! 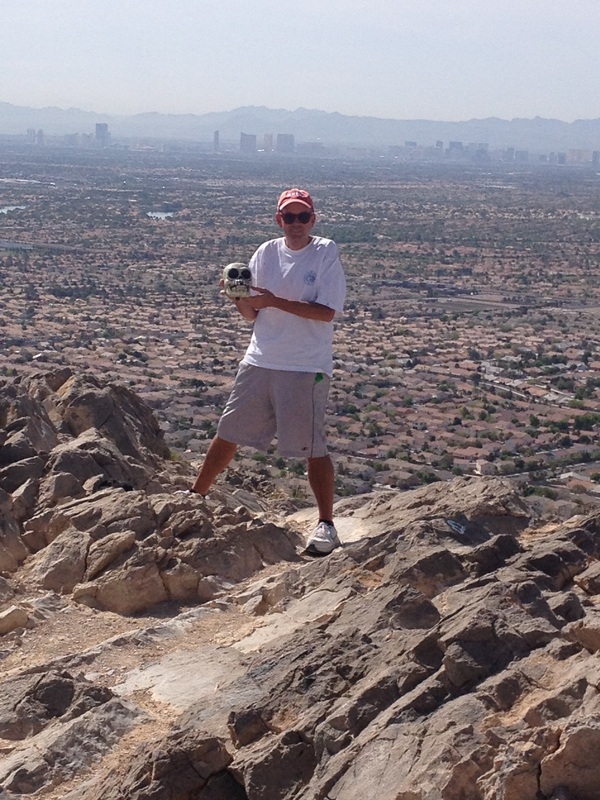 Today was slated for a hike with my brother to Black Mountain in Henderson Nevada. 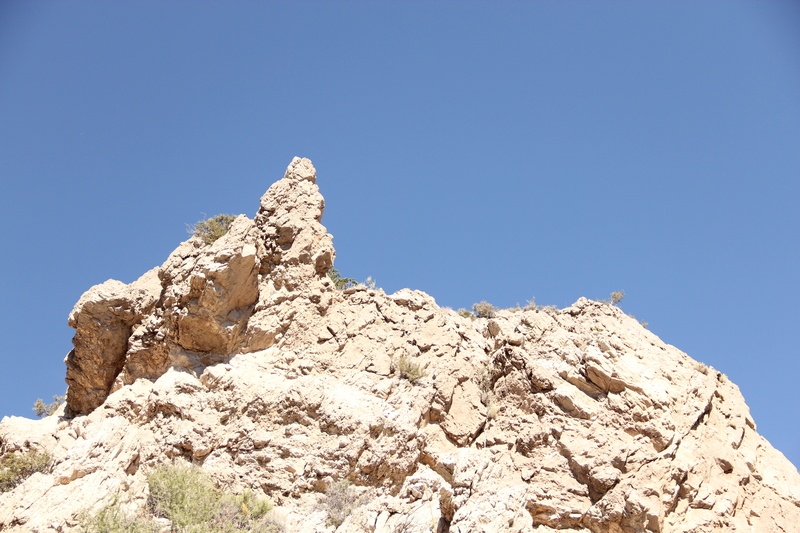 It is part of the McCullough Range. It sits right at the edge of the surge of housing that spread like a flood of red tile roofs through the 90’s and 00’s. 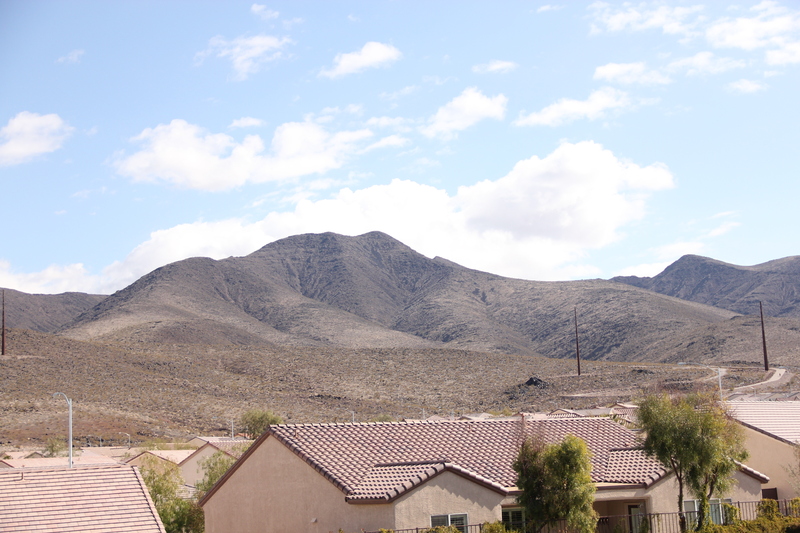 It is the tallest mountain on that end of town in that range. 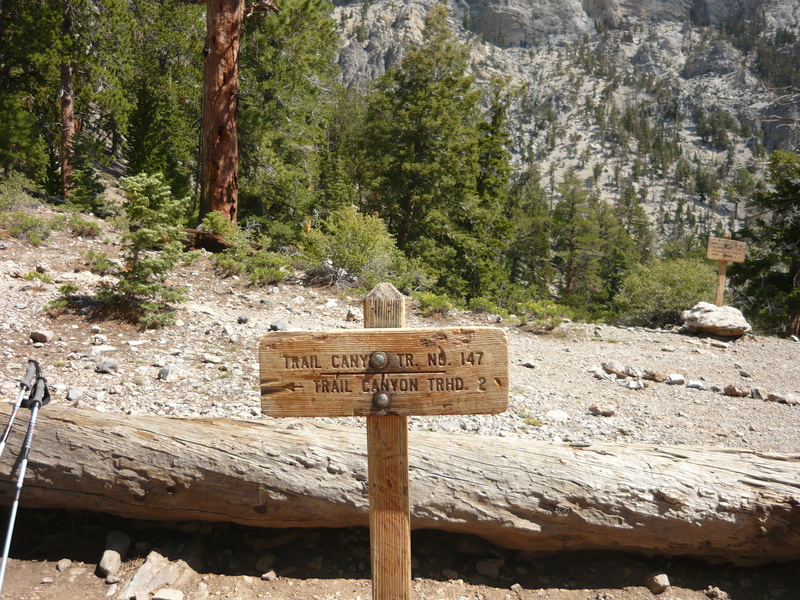 According to Trails.com, it is a 6 hour hike and gains 2k feet in elevation over 3 miles. 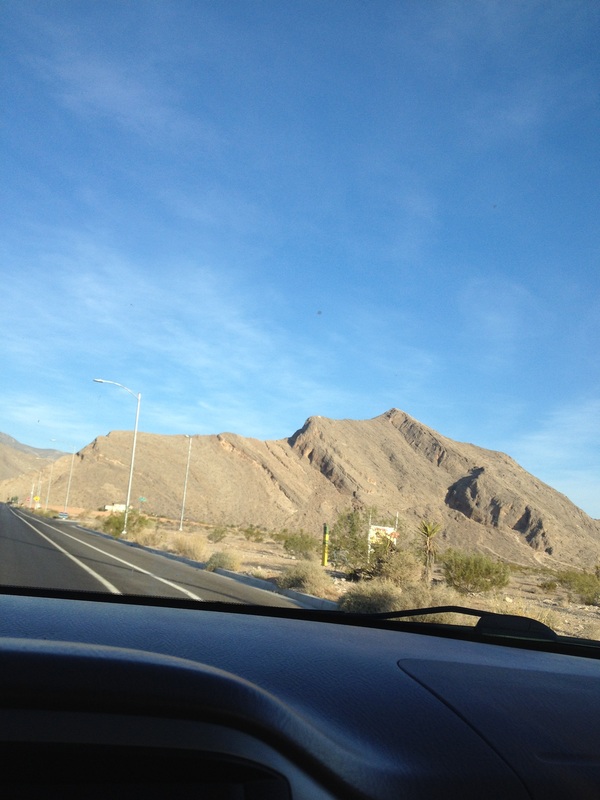 Joe was adamant that the information was wrong and that we should not be near that long out there so off we went. I was excited but apprehensive as well. It is only 5 weeks until I leave to Everest and this hike was fairly representative of a day on the trek. At least as representative as you can get 13,000 feet lower than the trek will be. A typical day on the trek going up will be 3 miles and 6 hours for that small distance. 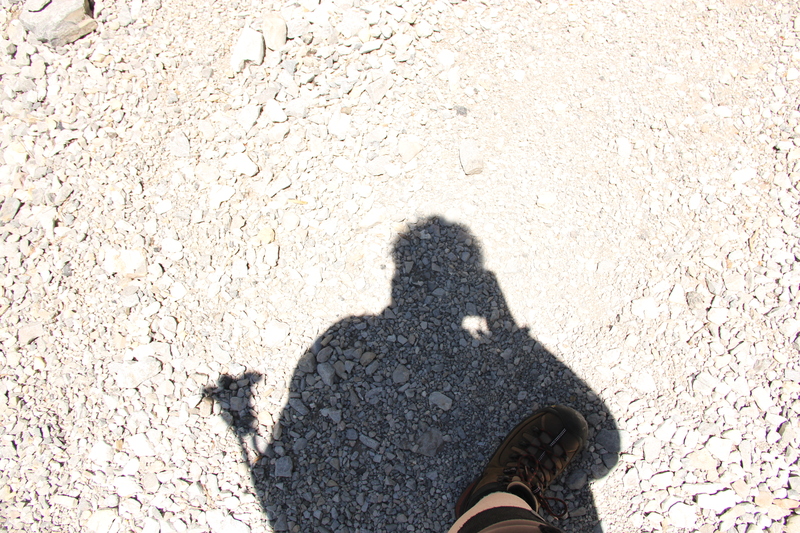 When I hike…or do anything challenging, I find myself in arguments with myself. If things are getting too hard I fight the voice in my head telling me I am not going to make it. To give up. To be happy with what I have already done. This hike was no exception. 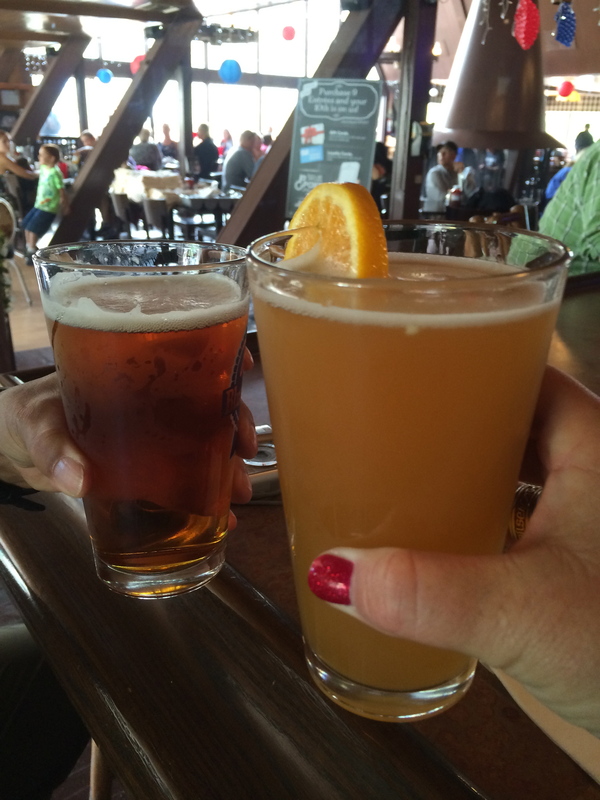 I had been hiking for some distance and drinking along the way. But suddenly I began getting cramps in my calf. I ate some Shot Bloks and went along. 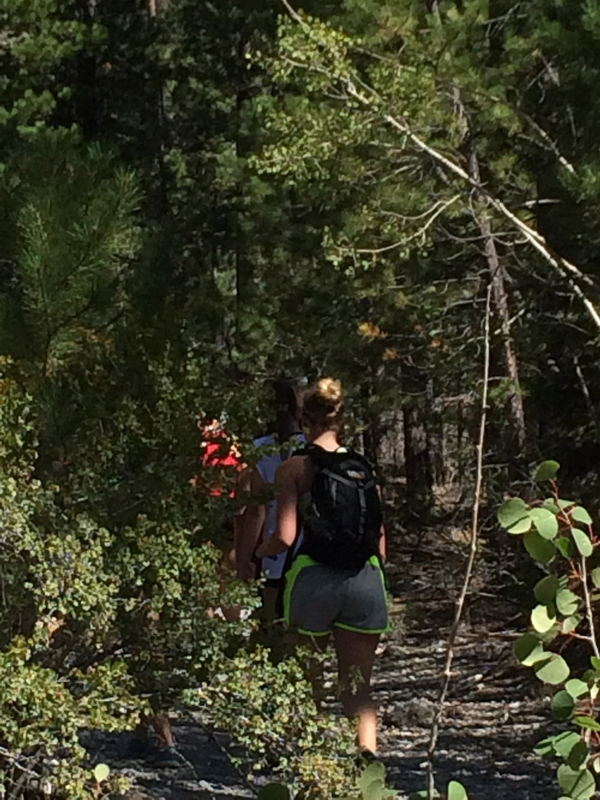 Once I hit the portion of the hike that really takes a steep climb, I started getting them in the other calf. I had to find some good rocks to press my foot up against to force stretching them out for about 15 minutes and then summit as fast as I could. Once on top, I drank another bottle of water and ate some more Shot Bloks for the trip down. I never had the attacks on the way down so I must have done something right. Las Vegas Strip on a hazy day. 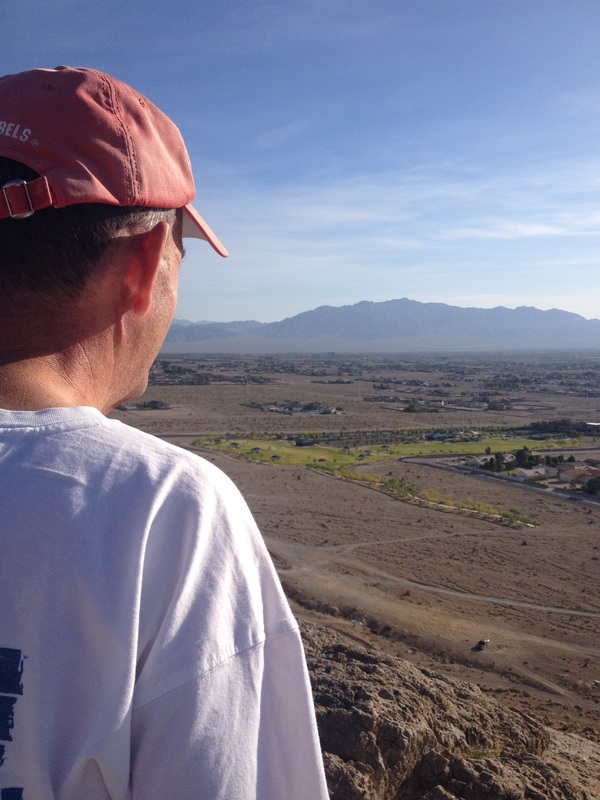 As you walk up this trail, you see Las Vegas on your left. Though this particular day, there was a big haze over the valley, you could see the Famous Las Vegas Strip pretty easily. 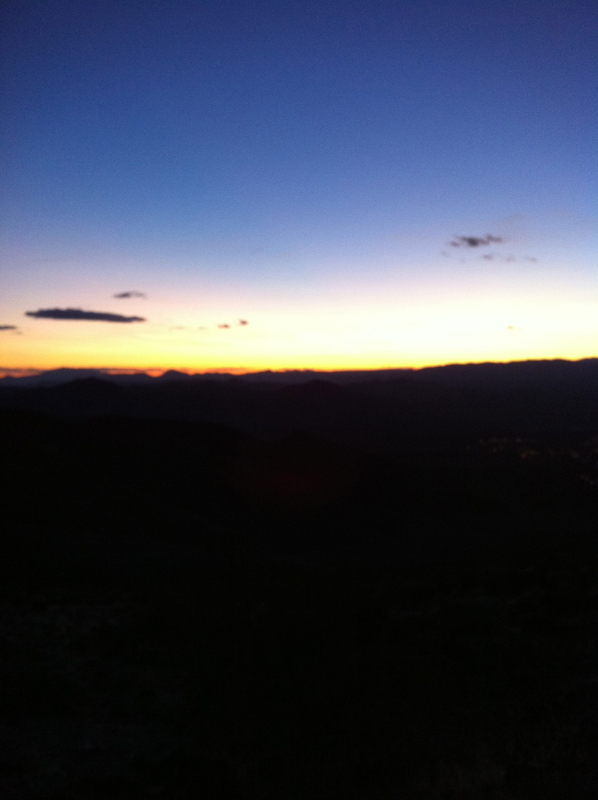 Because of our late start, the sun was going down just as I was down the first and most difficult section. I pulled my head lamp out of my pack and continued along the path. I had not hiked at night with a light before. The weather was nice. Just had my Eddie Bauer Hang Fire Hoodie and a t-shirt and was very comfortable. Again the doubts about my abilities…too old, spent too many years doing nothing to truly get back to a good fitness level. But as I pushed those thoughts out, I gained a new appreciation for just being there and doing it. How there is no way I could have even 2 years ago. Moreover, that 6 years ago, I was unable to even carry my books from my car to the classroom in Law School. It isn’t over til its over and I just cannot let it be over yet. Enhancement by David Cummings! Thanks David! A while back I went on a hike to Turtle Head. I went most the way but really just did not like that hike and the slough under my feet made me believe I was risking injury to claim the top. I had gotten a good workout, so turned back. Ever since that hike, Turtle Head mocks me. It looks at me from every corner of the valley. While up at Black Mountain, It mocked me from across the valley. So I asked a friend of mine what I could do to enhance a picture of it that was obscured by the haze and he gave me this back……stunning. It mocks me and after I get back from Everest, I will go back and put it to rest! I enjoy challenges. I often wonder if the challenge is what I enjoy over the activity. Especially when the activity becomes difficult. But in the end, I realize one is part of the other. I love the activity because it gets difficult and because I can have a sense of accomplishment at the end. 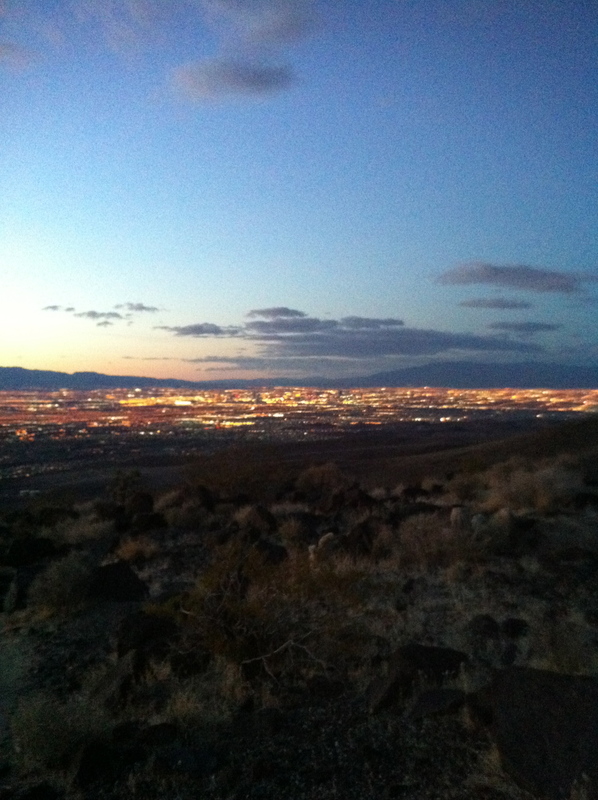 A look down at Vegas as the lights are coming on....lots of hiking left! Here are some more sights of the day! 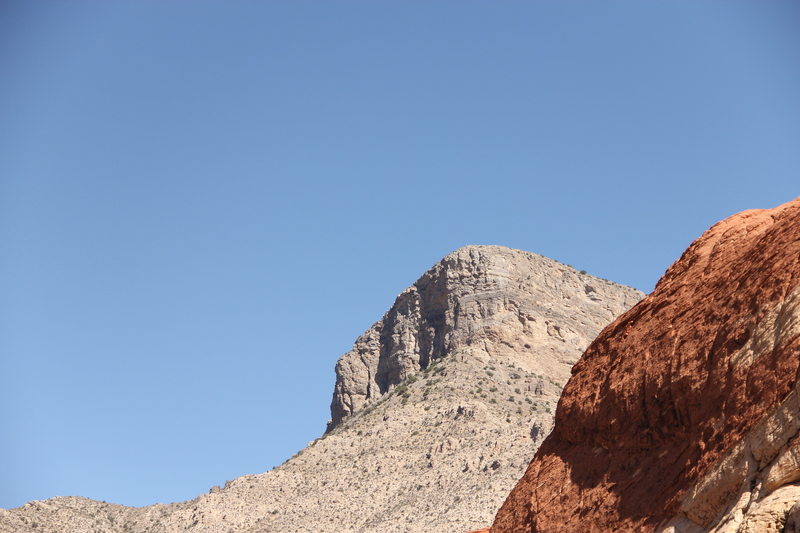 I finally got back to take on Turtlehead in Red Rock Canyon. I had gone last spring and simply pooped out before even getting close to the saddle. I was heavier and less fit at the time. So today it was going to be fun to get to the top. Joe picked me up and I was loaded with water, camera, extra cloths in case of cooler weather and my boots were laced up tight. I also decided to give the Glacier Goggles another run to see how they did. We pulled into the trail-head and Joe immediately left. He was going for time again and that was great. I was going for progress. 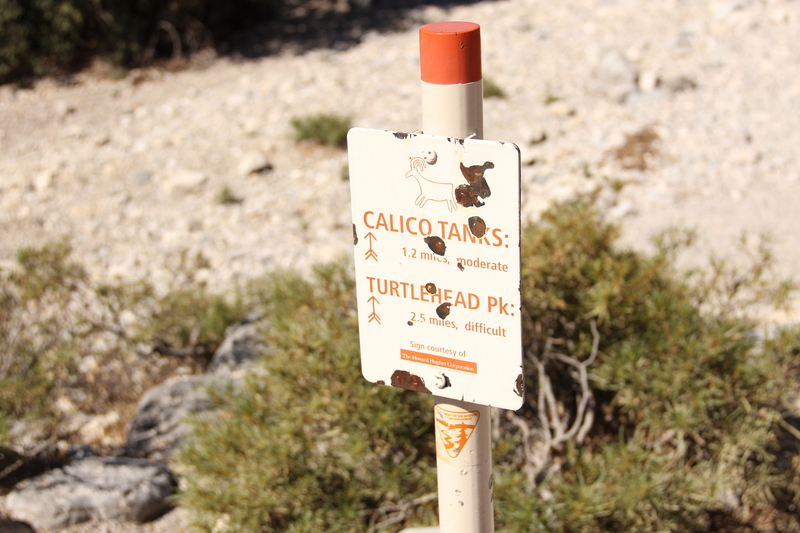 The beginning of the hike is shared with the start of the Calico Tanks trail and with some climbing walls I have been to so it is familiar and sort of old hat. But I immediately recognized that the effort was much different than it had been. Now was far better. Pretty soon I was at the point we took our first rest the last time I went. But I blew passed thinking there was no need to rest here. I felt like I had just warmed up and did not need to lose my momentum. It is at this point where the steepness begins so I had to drop down a gear and dig in. It was a fun bunch of work. 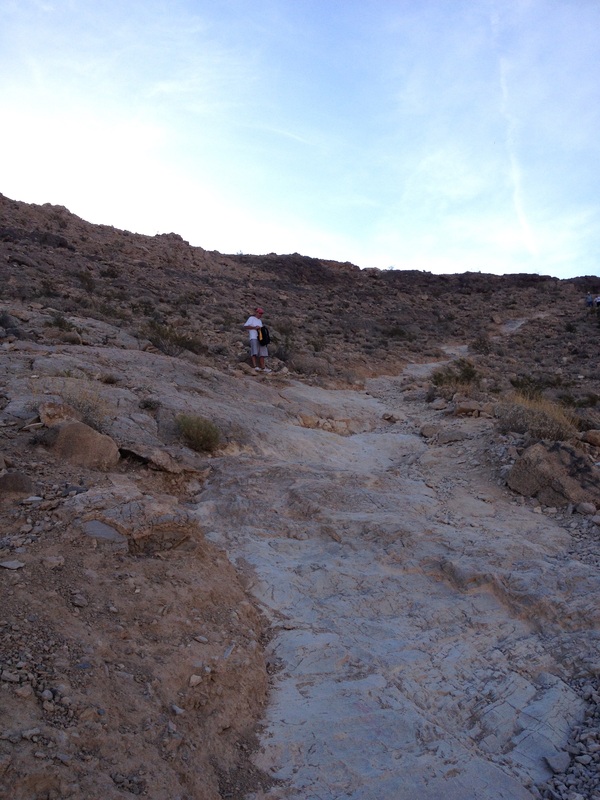 I chugged along and finally was at the point where you are basically scrambling around on goat trails. But I kept getting other hikers telling me I was better off on this other path…so I would go there and then get the same thing from some others. they were being helpful, but the truth is, I should have just picked a trail and stuck with it. I generally like scrambling. It is the part of climbing wall approaches that makes me work. 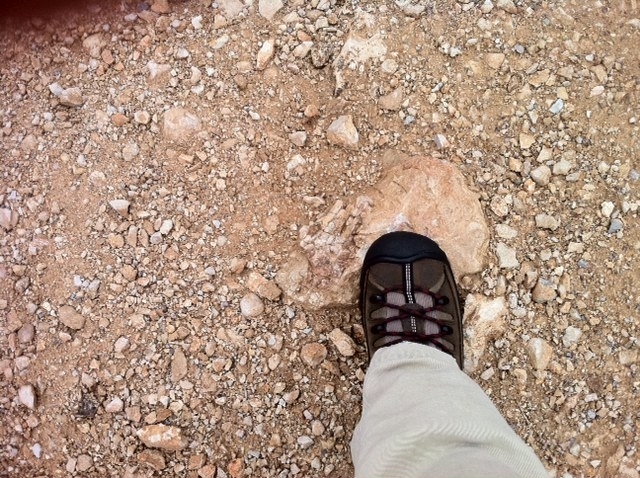 But when all the hand holds are rough, loose shale, well….not so much fun. I was doing well and working my way up. It was not difficult….it just SUCKED. I looked up to see how much more of this I had to endure and thought, why am I shredding my hands again? I am not going to be doing anything like this in Nepal and this simply is NOT fun. So, just below the saddle I turned back and worked my way down again. It was a good hike for what it showed me. It showed me that fun hikes are doable and I can turn back on ones that simply are not fun. It showed me my increase in fitness and that if I keep plugging along, things will be great in Nepal. After I got home I did suffer two days of thrashed knees. Note to self: Wear knee support on steep hikes. Period. I was looking forward to today’s hike all week. This being the first week of the 2 month drive to Dad’s 80’th, I was stoked. 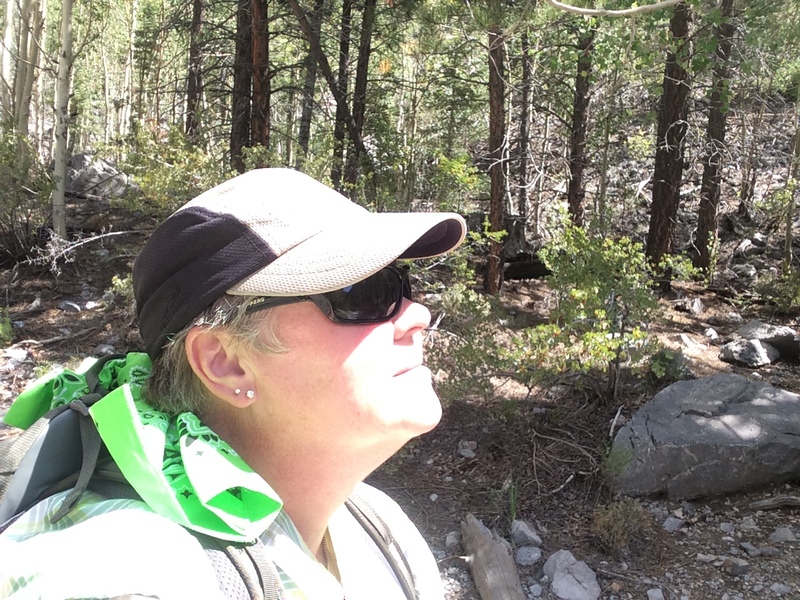 I had loaded my pack the night before and got my duds ready and hit the hay to get rested up for what would be a nice Trail Canyon hike to the Rain Tree. I would be trying out my new camera halter too since the last long hike took its toll on my neck carrying a camera on a traditional strap. It was also to be the first real hike on the new boots. We got to the trail head and Joe said he was off so that he could get his time and would meet me at the log. I was good with that. I am a slow hiker and he needs to enjoy the hike for his purposes as well. It was such a nice day. The sun was hot but the breeze was cool. The trail was steep but steady. My pack held lots of water, trail food, emergency/first aid kit, trekking poles, rain coat, multi-tool and sundry other small items. I had laced the new boots up well and taken precautions about blisters. So off I went. I had joked with Joe because he told me all week this was an easy hike, but the board at the trail head listed it as STRENUOUS. I delighted in calling him out for lying again. But now he was gone and I was huffing, puffing and photo-ing my way up the trail. Entering the WILDERNESS! Look Out! Then it happened. Straight outta the blue. No warning. I was dizzy and nauseated. I kept going a few more steps feeling fine….except for that. I stopped and hydrated. Still no change. Ate a cliff bar. Still no change. I rested a while longer and set out again. After all, I could have bad days on the trek and will have to push through then too. Soon, however, I had to stop again. This time I found a great place in the shade and settled in to wait it out. But the problem was no longer dizzy it was intestinal. I made an effort to go further but in a little less than two miles up the trail, I had to go down and find an appropriate rest room. I was SOOO disappointed. AND I could not let Joe know because we had no way to communicate. Almost like we had been thrown back into the 70′! Luckily, a group of guys came up the trail and I was able to ask them to let Joe know I was descending the trail and for him to continue. I got down and took care of things and then sat on a rock and just enjoyed being outside while I waited for Joe to return. There were great sounds all around. 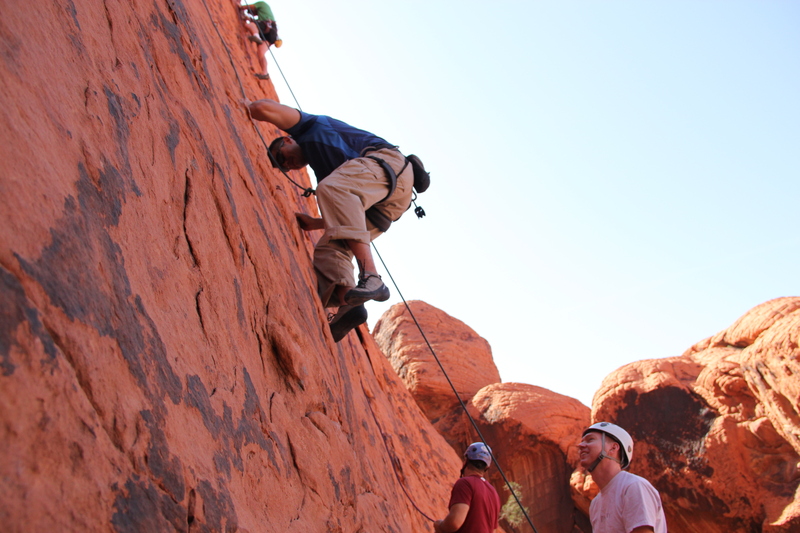 I had been hearing the voices of rock climbers on a climbing wall as I descended and it was calming. The birds were out, the wind in the trees made a sound like water. It was great. After my disappointment I reassessed the day. I had no blisters and loved the way my feet were feeling the whole time. Still got in over three miles and was gaining altitude all along the way up. Perhaps the big change in diet contributed to what happened today. I do not know. But all of these hikes are to serve a purpose and this one served many. 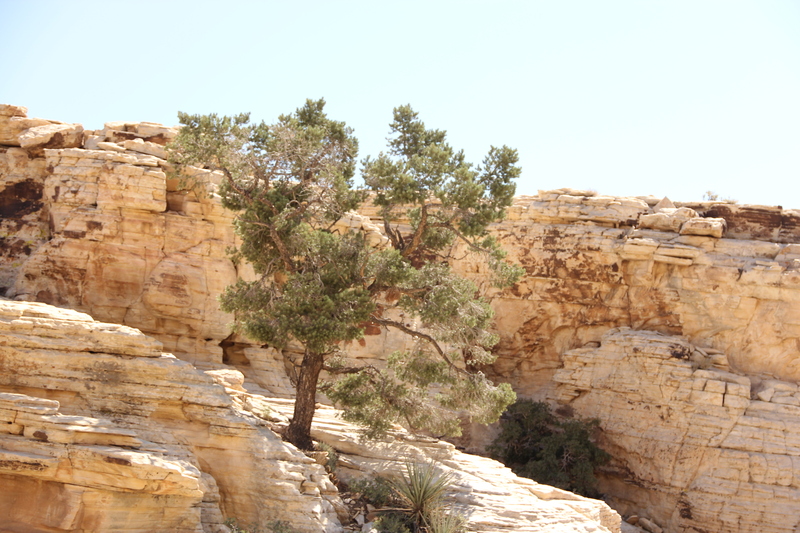 Yesterday I was excited to be headed back to Mount Charleston for some hiking and to see the rain tree. Joe had the day off and was going to pick me up. I had not got in a hike since the South Loop Blister Fest. As I sat reading Dead Lucky, by Lincoln Hall, the phone rang and it was Joe on the other end. “Looks like thunder and lightning storms today,” he said. I acknowledged that it was pouring at my house as we spoke. I looked at the hour by hour forecast and we were sunk. We wrapped up our conversation agreeing to meet for coffee later. 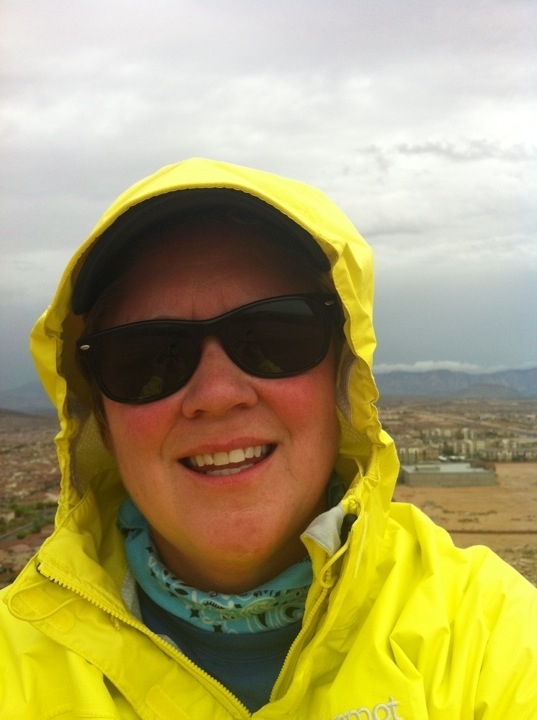 In the mean time, I laced up my boots, put on my rain jacket and headed to Exploration Park. It is part of the master planned community in which I live. At the entrance there is a little hill called Exploration Peak. Boy scouts have marked out trails up and around it. From the top there is a nice view and signs that show you what you are looking at. The park below was full of people despite the rain. There is a little water fountain area that is designed for kids to run and play in and the rain didn’t stop the kids from playing in it. Of course, while the rain came down the temperature was still about 84f. So, up I went. It isn’t difficult or long. But it is steep and steep is good for preparing for the trek. 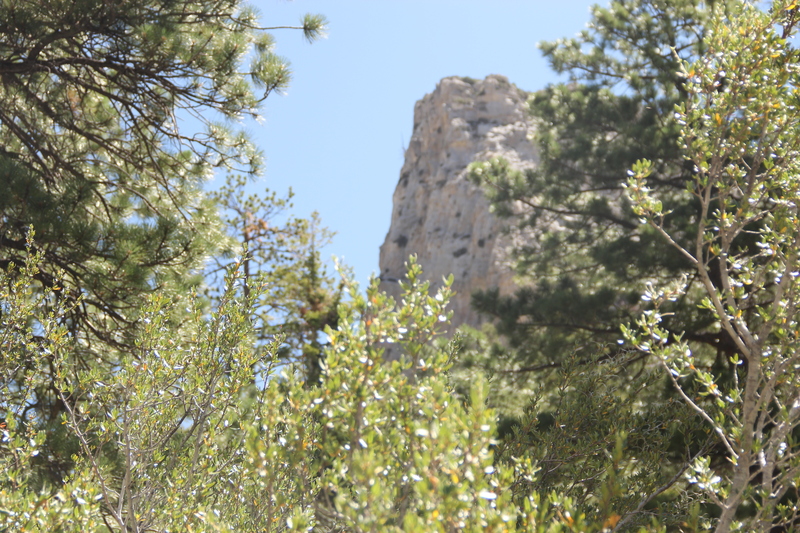 A young man was running up the trail to the top…repeatedly. I was simply trying out the new boots and getting a little stretch of the legs. I had the arm vents of my rain coat open because of the humidity building inside. It was peaceful hearing the drops of rain tap out a rhythm on my hood. My boots were like wearing slippers and my fear of blisters retreated from its heightened state from the last hike. I was happy to again be wearing my Keen Oregon PCT’s. 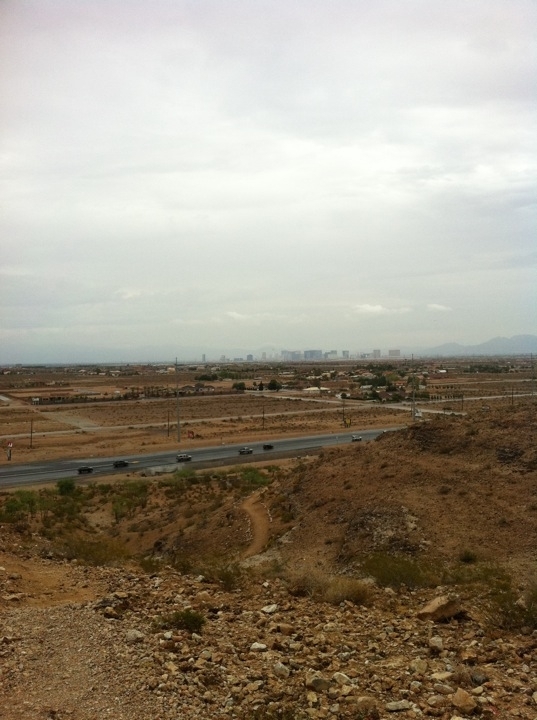 As I sat atop the little hill, I looked off into the distance toward the strip. The clouds hung low and I felt like I could easily be back in Seattle during a summer rain. The Stratosphere closely resembles the Space Needle from a distance. It felt nice. 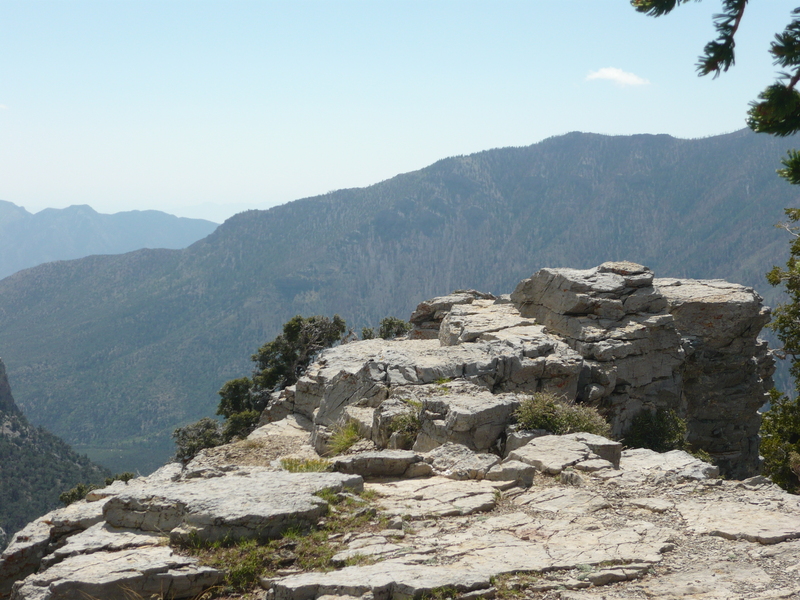 While I would rather have been on a complete hike, there was fulfilment even in this small stroll up Exploration Peak. I did join Joe later for coffee. 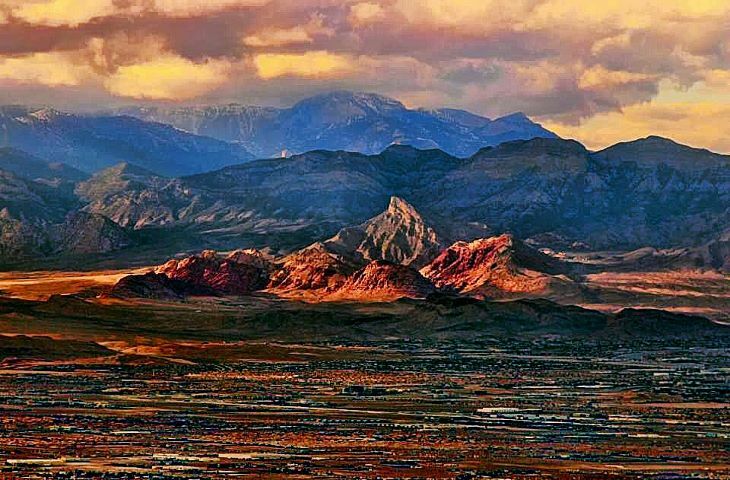 We sat on the patio at Starbucks on Horizon Ridge in Henderson and looked out across the Las Vegas Valley toward Mount Charleston. Not only was it engulfed in clouds, a large, thicker bank hung low on the mountain. Part of me wanted to be there. Even in the pour down rain. 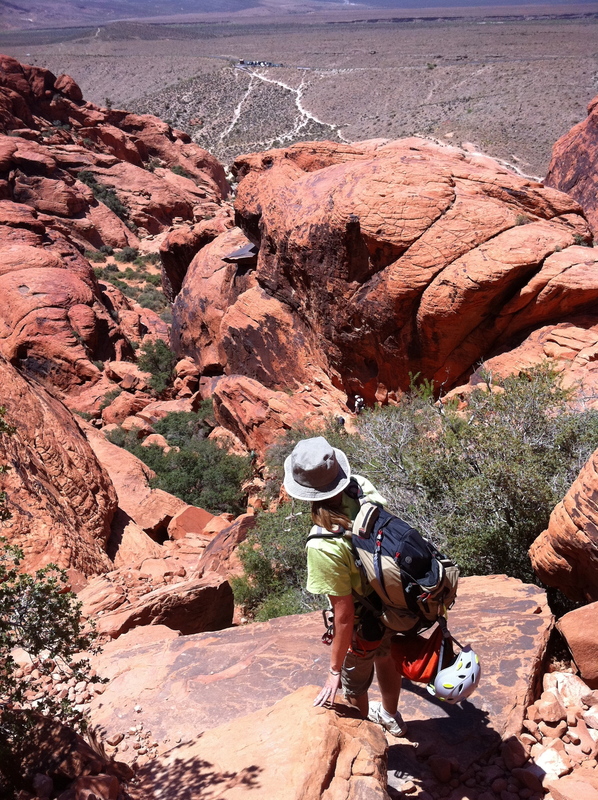 But, as my friend Rosie says…I WILL LIVE TO HIKE ANOTHER DAY! Day 1: Descend 650 feet, breath 73% O’s, travel 3 miles. Day 3: Ascend 1587, breath 60% O’s, travel 6 miles. Day 4: Ascend 1363 feet, breath 57% O’s, travel 5 miles. Day 5: Ascend 2200 feet, breath 53% O’s, travel 4.5 miles. Day 6: Ascend 850 feet, breath 52% O’s, travel 10 miles. Day 7: Ascend 1500 feet, descend 1500 feet, breath 50% O’s. Day 8: Ascend 575 feet, travel 3.2 miles. Day 9: Descend 575 feet travel 3.2 miles. 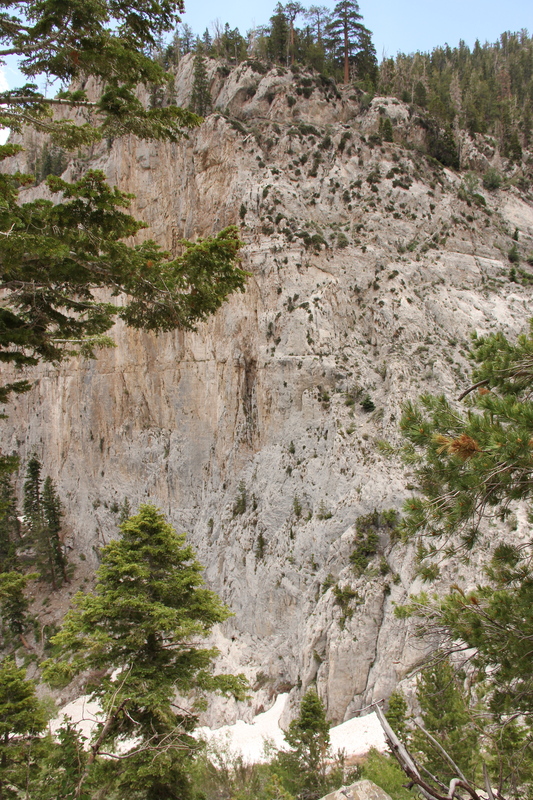 Day 10: Descend 2400 feet. Day 11: Descend 3300 feet. Day 12: Descend 1950 feet, travel 9 miles. I still have some research to find some info to fill in toward the end of the return, but clearly, this is going to be a knee crushing, leg whipping, lung busting adventure! My Three Year Old Does That One…..
At work, when we are standing around the proverbial water cooler and I am regaling them with stories of my weekend adventures, one or two of them often tell me their three year old kids can do that. It is all in good fun. But it is true also. Their kids are out their burning up trails I am struggling with. 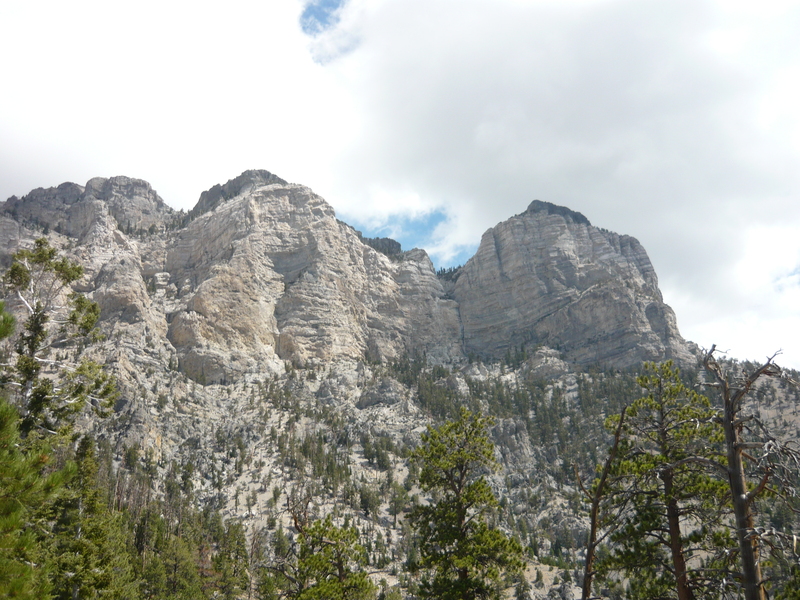 Yesterday, my brother and I went to the South Loop of Mt Charleston. 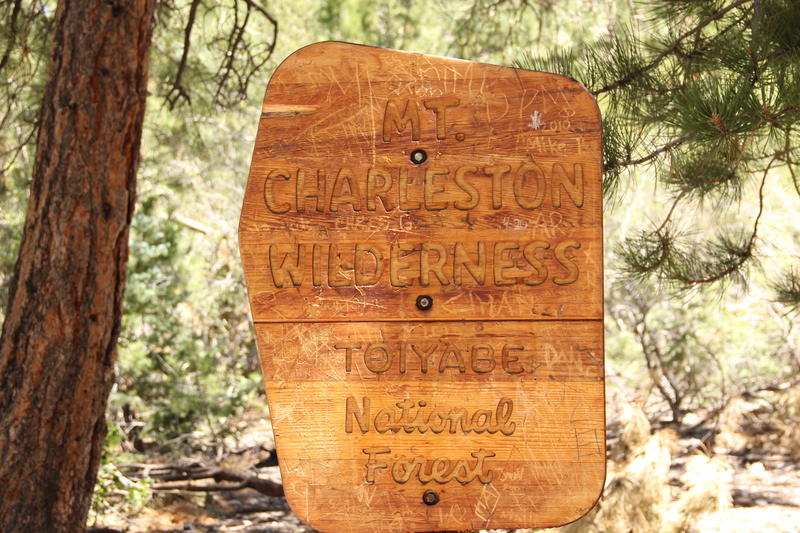 Charleston is the highest peak in the area. 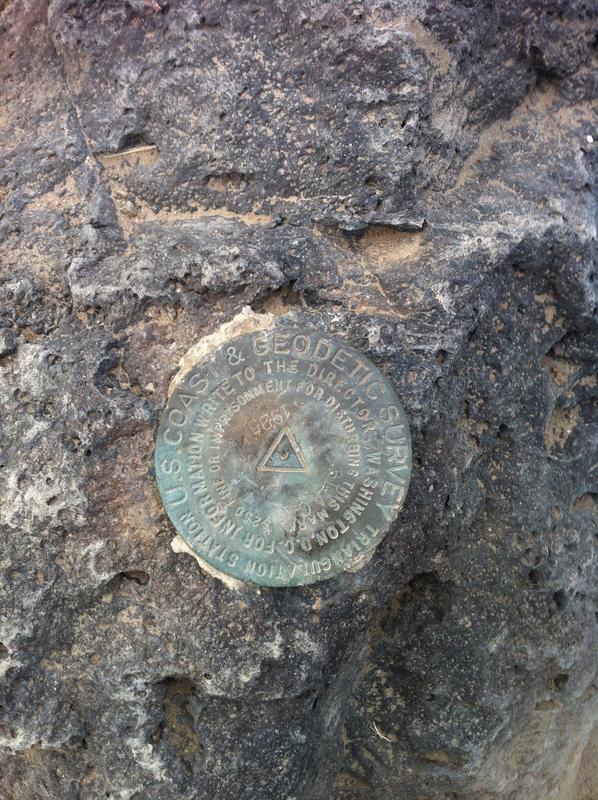 We had no plans of going to the summit, but we were hoping to go to what is called the Saddle. 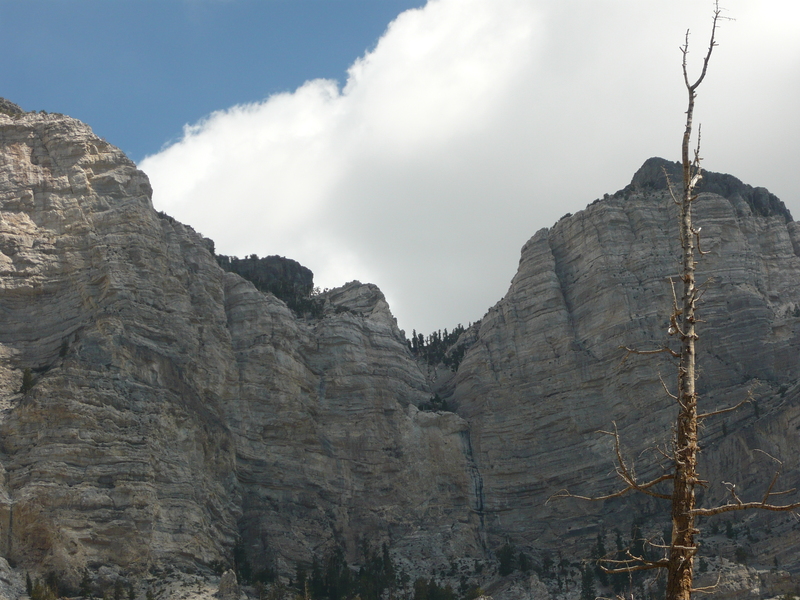 I was a bit nervous because this hike starts at 7600 feet. 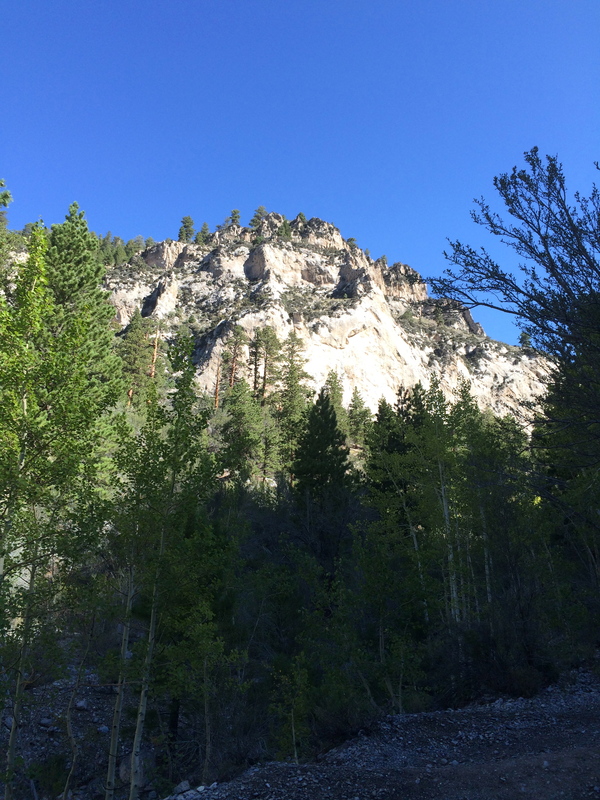 I am always worried that I will start out and find that as the altitude increases I will find some aversion to it that will indicate I am one of those people who cannot do the altitude thing. I am borrowing worry. I know. We started out and as usual for me, I get winded right off the bat. I never know if that is because I try to keep up with my brother or if it is just the way I warm up. My brother asked how it was going and I said fine, but he kept telling me we were on the flat. He lied. And he laughed about it after. I know he lied because when I was coming down later, my knees took a beating on that part of my decent. I guess since he doesn’t have a three year old to brag about running full speed on these trails, he just lies about the trails. We passed a lot of people coming down. 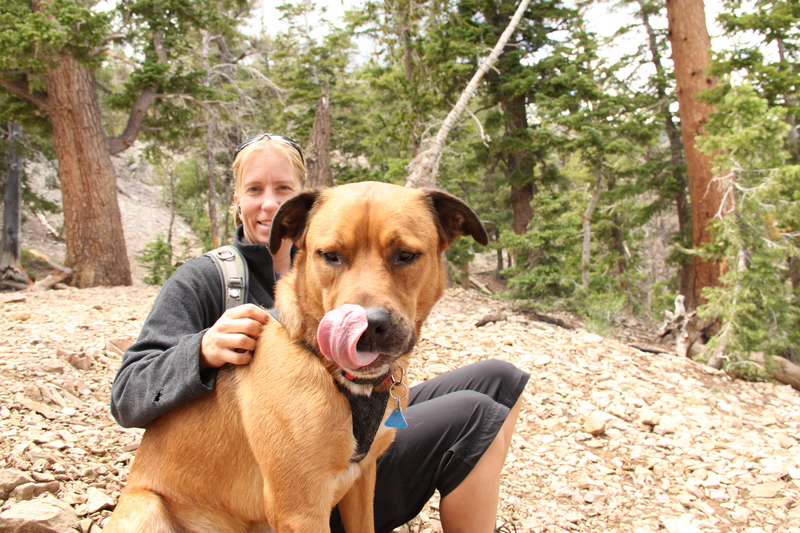 And my kayaking pal Kate Sigworth was on the trail with her dog (over three). She started when we did but was coming down when we were just to the first overlook. She had offered to hike with us but I told her that I was so slow that she would not get done what she was there to do. I use a trip tracking program to track distance and altitude changes in the hikes I do as well as to map routs to climbing walls. It is called EveryTrail and this is the South Loop information it recorded for me. I find that it does some strange stuff. If you look at it it seems to go off and record some weird running around stuff that I know never happened. But it is what I have right now and it recorded that I gained 2200 feet in elevation on 4.5 miles. 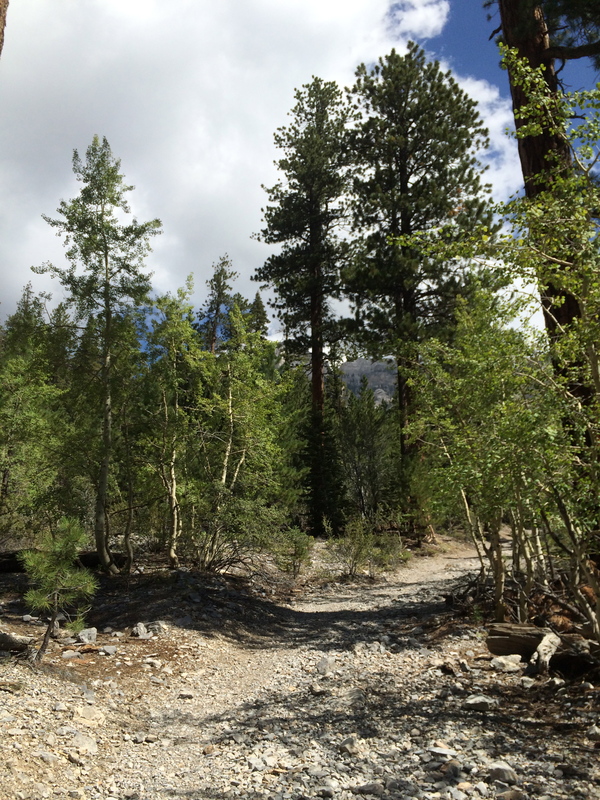 SO my hike was 9 miles and topped out at 9800 feet of elevation. My Base Camp trek will start at 9350 and actually descends from that altitude to 8700 feet that first day. I don’t think altitude hits me hard but will have to get higher to have a better idea of that. Going up was very slow for me. Four hours to get 4.5 miles in 2200 feet. Coming down took 2 hours. Mainly because there were lots of little stair steps that wreak havoc with my knees. In the first mile going up I had two huge blisters on my heels and coming down my toes and balls of my feet were either dead or on fire. That means the Asolo boots I got are not the ones for me. I will go back to the Keens I had before. But as I sit hear today, my muscles are not sore. My knees and feet are, mainly bone sore from bad boots and lots of steep decent. So all in all, I might not beat your three year old. But I can drive and don’t have to go to bed early. So there is a trade off. Today’s approach to the newly bolted Meetup Wall was rigorous. It was 1.5 miles in, but was up, up, up with scrambling being the word of the day. I find that some things that I try to do still intimidate me and I tell myself I am unable. That slows me down. Lots. But on the up side, I never gave up and I made it. I got some help and that was great. But I have to get to where I am self sufficient. The day was pleasant and warm. The destination was flooded in shade. This was a knee buster that really crashed the knees, both going up and going down. 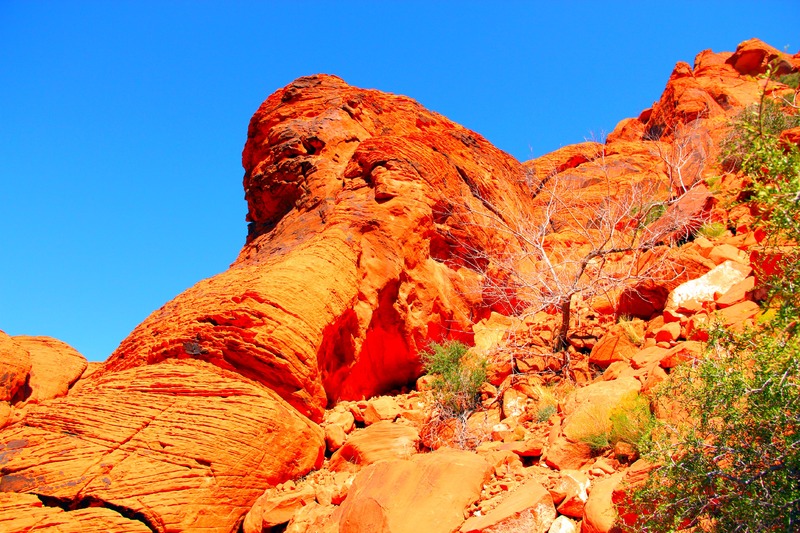 But the view, the rocks, the sky…..all worth every bit of it. ch as more difficult than the approach to Cut your Teeth wall. I really do not think I could have nade it up this approach last fall when I first did Cut your Teeth. The CrossFit has helped and if I could just increase my participation there I would see great results. So that is what I need to do! and an extensive first aid kit. So. I still have a lot to get and am excited to acquire all I need!